I recently re-entered the blogosphere and twittosphere, and the Internet Gods have already been good to me. I co-wrote a piece with my friend and colleague, Justin Knapp, who shares my passion for Michigan, about the current state of the EB5 Immigration Investment market in China. The article, “Is the Chinese Dream an EB5 Visa?,” was posted last week in China’s largest business and finance online journal, Caixin Online. You can read more from Justin and how to live a “Richer, Fuller Life in West Michigan” at Goodallfocus.com. Is the Chinese Dream an EB-5 Visa? Dream chasing is a popular topic in China these days. Thomas Friedman sparked the debate last October when he wrote a column titled, China Needs Its Own Dream. More recently, TheEconomist and CNN have also taken a gaze into the crystal ball to interpret China’s dream. Chinese leader Xi Jinping, has loudly adopted the slogan “Chinese dream” while keeping quiet on the details of what that dream might be. Meanwhile, the American dream continues to be peddled in China’s mainstream culture and media. With foresight, the United States can benefit from this trend. Today, more Chinese nationals than ever before are trying to live their dreams, not within the borders of China, but by gaining permanent residency status in the United States through investment and job creation. In fact, according to the Hurun Wealth Report 2012, more than 16 percent of China’s millionaires have already emigrated or submitted immigration applications, while 44 percent are planning to do so. The Immigrant Investor Pilot Program (the EB-5 visa) was created by the Immigration Act of 1990 to stimulate growth by attracting foreign direct investment and creating jobs in America. To qualify for a visa, individuals must invest US$ 1 million or US$ 500,000 in a Target Employment Area which is a rural or high-unemployment area. Additionally, this investment must create and sustain at least 10 jobs on American soil. Demand for the visa has fueled growth in third-party managed investment vehicles known as Regional Centers which are both privately and publicly run. To illustrate how quickly the EB-5 program has grown in the United States, the number of Regional Centers has increased from around a dozen in 2007 to more than 250 today, including at least one in every state. While the public profile of the program has been marred by a small number of high-profile, soap-opera-like scams, the difficulties faced by applicants are in fact more mundane: identifying profitable investment projects and creating 10 jobs. After a two-year waiting period, if an investment project fails to create 10 jobs, the foreign investor risks losing their investment and permanent residency in the United States. Last year, the U.S. Citizenship and Immigration Services hired half a dozen economists to help evaluate the job-production claims, but many believe this added scrutiny has created a bottleneck in the approval process. The Association to Invest in the USA, which advocates on behalf of Regional Centers and industry service providers, recently noted a backlog of nearly 6,000 EB-5 petitions which are currently held up. At the low-end, assuming US$ 500,000 per investment, that’s potential for nearly US$ 3 billion and 60,000 American jobs. Finding information about the number of deals in the pipeline is challenging. It has been reported that American businesses raised more than US$ 1.8 billion through the program in the fiscal year ended September 30, and over 7,500 would-be immigrants were issued visas. Interestingly, 80 percent of them were Chinese, a dynamic shift from the mere 25 percent just four years prior. Time will tell how China defines its dream, whether it creates one of its own or simply adopts the American dream along with an American home. For now, Chinese investment in the United States can help boost the economy and put Americans to work. If it can stick to its founding principles and map out a clear long-term vision, the EB-5 program shows promise in helping both Chinese and Americans realize their dreams of successful and healthy local economies. One thing that impresses me about Beijing, despite its shortcomings and inconveniences (as I write this, the pollution level has surpassed 500 on the PMI 2.5 scale – read about it here in Bloomberg today), is that people are just generally interested in foreigners. After all, of the population of over 20 million in Beijing, only about 200,000 are foreigners, roughly 1%. For locals, its simply curiosity. For Chinese society, foreigners treading on China’s land is an essential part to China’s strategy to continue to expand and grow in the modern economy. 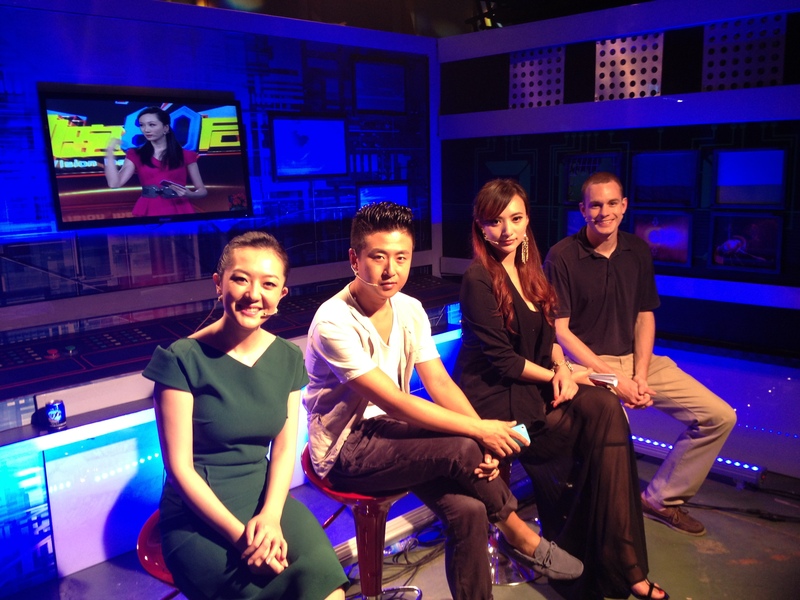 For almost 2 years living and working in Beijing, the TV opportunity had escaped me. And then suddenly – it happened. Actually, it was the Spartan Network that finally delivered the opportunity to grace the bright lights and cameras of Chinese television. My friend and fellow MSU alum, Ray Wu, invited me to part of the show his wife, Cici, hosts on CCTV 7 农业节目电视台（Agriculture and Education Channel) this week, and needless to say, I jumped at the opportunity. The show is called “助跑80后” (english translation：The Road After 1980), and the program involves Cici inviting famous entrepreneurs or public figures that have had success in the “New China” since the economic opening up in the late 70s – early 80s. My role was to be part of the hudongtuan, which essentially is a group of 3 to 4 people that sit on stage and engage the guest and the host in a meaningful dialogue. I participated in two shows, and among other things, it turned out to be a great networking opportunity. The first show featured Zhang Cai Ming, CEO of China’s largest underwear and lingerie brand, Aimer. On the second, we spoke with the CEO of JP Morgan’s China Investment Banking Division, Fang Fang. In the latter, I was able to give a major shout out to the Michigan State University Beijing Alumni Club when discussing networking techniques in China, which I felt pretty great about :). While the shows both went smoothly, as a foreigner, it is a bit of an exhausting and challenging experience. Quite obviously, everything is done in Chinese, from the pre-production planning meetings, to the backstage interviews, to the on stage dialogue. For anyone that understands how difficult it is to communicate in a foreign language, you know that it is more than just being able to have a conversation and use the vocabulary you know. One has to simultaneously demonstrate cogency in the Chinese language while following the flow and dialogue of the show. These are very much professional skills learned over years of training. I think I held my own up there, but most of my comments remained short. I was, indeed, the “token white guy.” Honestly, that really was the point. I learned that, regardless of my ability to contribute substantially to the show, in the end it did not matter. It is just important to have foreigners periodically show up in Chinese domestic productions to demonstrate China’s efforts to reach outside its borders. It will be difficult for China’s culture and production to really expand out into the world. Most people do not speak Chinese, which makes it difficult to recruit foreigners like me to take part in production, or even watch their movies or television. But as genuine efforts like this continue to grow, and Americans grow the confidence to use their Chinese participate in these types of productions, these exchanges can lead to some extremely beneficial results for U.S. – China relations. The show debuts in a few weeks. I will be sure to send you all the link when it goes up online! Another great example of the power of the Spartan Network! As the President of the MSU Beijing Alumni Club, I am not only responsible for organizing and hosting events to bring together Spartans here in Beijing. I want to make sure that MSU’s presence and the “banner of Sparty” is heard and felt throughout Beijing and China. I became involved in “ACB” because I saw it as an opportunity for the MSU club and for the university to make itself known in Beijing among others that share their passion for their university. Moreover, it is also an enormous resource I can share with our club members that are looking for a job, a project, or anything to “get their feet wet” here. Beijing is indeed one of the world’s most important cities; it is also one of the largest, and thus easy to get lost. ACB is a tool that can be used to really take advantage of “six degrees of separation” to move more efficiently. I am proud to say that among the crowd of universities involved, MSU has really been recognized as one of the most active, successful clubs. We have now co-hosted a first and second annual “Big Ten Pre-Alumni Ball” Mixer, in 2012 and 2013, respectively, each year bringing around 200 folks out for networking and fun. 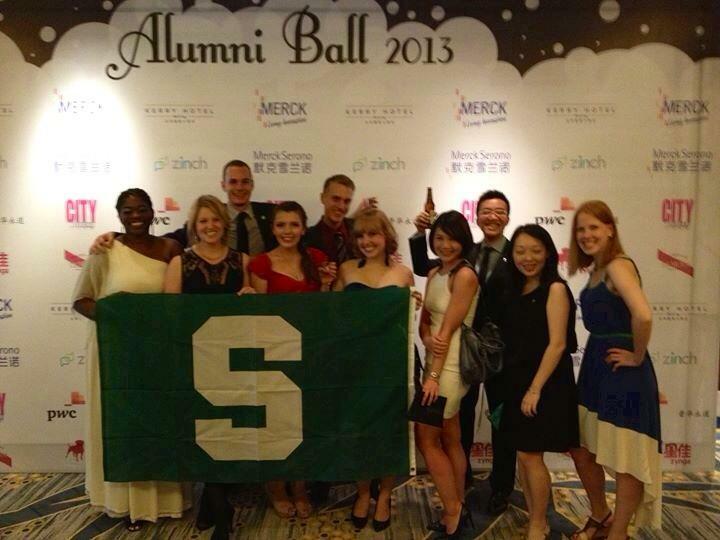 This year, MSU once again participated in ACB’s signature event, the 2nd annual “Alumni Clubs of Beijing Ball.” As you can see from the picture, MSU was well represented by a group of top notch Spartans. We sure do look good, eh? As my friend, Scott Westerman, Director of the MSU Alumni Association always likes to say, there are Spartans everywhere. Here in Beijing, we are uncovering a gold mine.